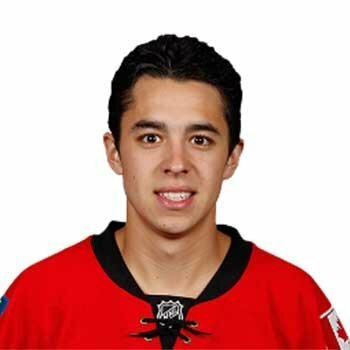 Johnny Gaudreau is an American professional ice hockey left winger currently playing for the Calgary Flames of the National Hockey League (NHL). He has previously played for the NCAA Division I's Boston College Eagles from 2011 to 2014. Gaudreau was born in Carney's Point, New Jersey to Guy Gaudreau and Jane Gaudreau. He attended Gloucester Catholic High School in Gloucester City, New Jersey, across the Delaware River from Philadelphia. He graduated from Dubuque Senior High School in Dubuque, Iowa. Johnny originally intend to sign with Boston College's rival Northeastern University, but changed his mind when Northeastern's coach resigned. He led Boston College to the Frozen Four in 2011-12. Johnny's father Guy Gaudreau coached his junior league teams. His younger brother, Matthew, is currently a junior playing for the Boston College Eagles. He has been always private about his personal affairs and girlfriend. Johnny was the 2014 winner of the Hobey Baker Award as the best player in the NCAA. He has won Walter Brown Award. He was a finalist for the 2015 Calder Trophy, given to the NHL's top rookie, after scoring 24 goals and tallying 40 assists during the 2014-15 season. Allen Ezail Iverson is an American retired professional basketball player who played for four different teams i.e Philadelphia 76ers, Denver Nuggets, Detroit Pistons, and Memphis Grizzlies. Tiger Woods is one of the topmost, prestigious and professional golf player. He has won several awards, trophies and fames. He is also regarded as the highest-paid athletes of the world.